There is nothing more captivating than watching the comings and goings of all manner of wildlife in your garden. But to ensure your garden attracts as much wildlife as possible it’s important to plan a dedicated area and choose the right plants and structures. By creating spaces which invite a rich abundance of insects, you will soon see your garden become a haven for all manner of creatures. We have such a wonderful diversity of birds and bats in the UK. 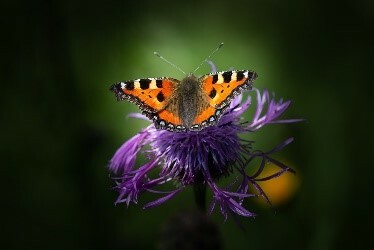 A little thought to how you can attract as many feeders into the garden can create beautiful spectacles all year round. 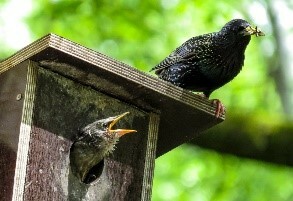 Bat boxes and bird boxes are a great way of providing shelter, attached to trees or stakes and poles put in the ground. Bird feeders dotted around the garden help give the birds extra sustenance during the cold months when food can be scarce. Plant a native hedge in place of a fence. This creates wonderful hiding and nesting places or birds, especially if you don’t have any trees nearby. 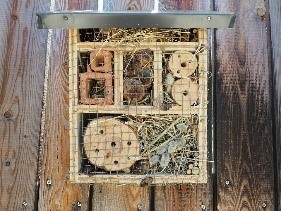 Bee hotels are fantastic when constructed in a quiet corner of the garden. Natural habitat is shrinking at an alarming rate in the UK and bees need as much help as possible to survive in the wild. Plants such as Geum ‘Pink Bell’ and Scabiosa ‘Pink Mist’ are perfect attractors. Also, although it can be invasive, a buddleia managed properly is great for attracting both bees and butterflies.Building a simple structure like a wooden box or shelter and filling it with bee-friendly hiding places really plays a part in attracting these essential pollinators into the garden. Creating a wild garden does not mean you can’t create beautiful borders. Select wonderful bee-friendly plants and arrange them as if you were building a show garden. 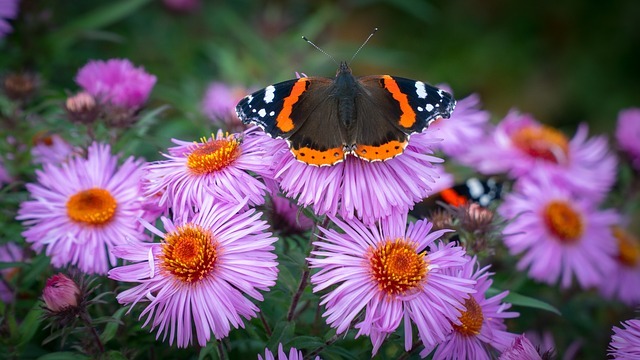 A border full of plants devoted to attracting wildlife can be both beneficial and look great. Essential elements for any wildlife garden – Trees and shrubs for cover, long grass and water. Buddleia – a classic choice for the adult butterfly. Verbena – This tall stemmed flower is rich in nectar and can be planted with other plants without swamping. Field Scabious – Despite the name, these beautiful flowers, like Verbena are nice and tall, creating height. If your garden is surrounded by a fence, cut a small hole around the size of a CD case to give them access. Alternatively, dig a small tunnel under the fence. If you are clearing away piles of leaves and debris from your garden, be sure to check that you don’t have hedgehogs living in them! To supplement their insect diet during the cold months, leave out some cat or dogfood (not fish-based), but do not leave out milk or bread as these can make them very ill. Put the food in a tub at one end with a hole cut in the other just large enough for them to get in. This stops cats, dogs and other animals from stealing their food. 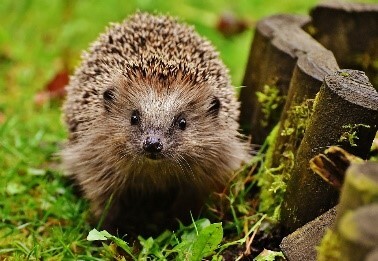 If you have a pond, ensure that there is a way for hedgehogs or other animals to climb out if they get stuck. Fill a plastic box with dry leaves, cut an entrance and ventilation hole and then place the hedgehog ‘den’ in a secluded part of the garden. Pop another sheet of plastic over the top and cover with logs to create a haven for them to nest in. A pond needs to be half in sun all the time, so do not position it under any trees. Mark it out using a flexible line that can be easily moved and adjusted such as a rope or hose pipe. Once you have marked it out, live with it for a few days to check where the sun comes and goes. Only then, when you are truly happy should you start the process of digging it out. Have a shelf at one end of the pond so that you can position different varieties of water-friendly plants without having to rely just on pond weeds and oxygenators, although of course these are still essential. Create a natural slope into the water at the other end to act as a beach. This allows the wildlife to come down to the edge to drink without the possibility of drowning. When building up the walls of the pond with rocks and stones, don’t line them up too uniformed as you want to create as many nooks and crannies for the wildlife to make their homes. You can use our Woodland Mulch to line the edges of your pond. When choosing plants for the pond, be sure to not to use normal potting compost as it will add too many nutrients to the water. You want a low nutrient, loamy compost, such as our Wildflower Topsoil, which has a low fertility and a sandy, loamy consistency. Re-pot them in pots designed for use in ponds. These will be specially designed with a mesh-like material perfect for allowing the roots out and water in. Plants like Water Forget-me-Knot are perfect for tadpoles, whereas yellow Iris is perfect for dragonflies. 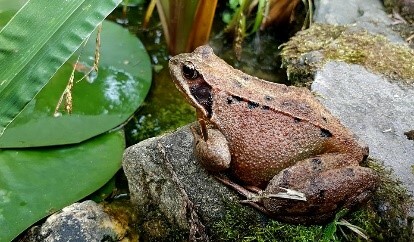 Basically, if you get it right, your pond will attract all manner of wildlife very quickly.